is stunning by itself or with a matching runner. Runner is 14" x 40", with braided trim. These are my latest works in fabric. 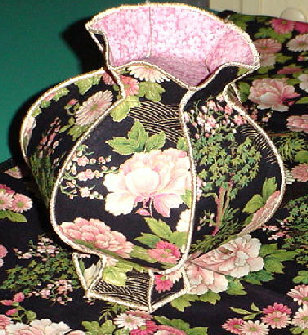 These vases are fabric and made the same way my bowls are, except in a different shape. 100% cotton fabric, the vases usually range from 6-12 inches tall and come in a variety of shapes, giving you the opportunity to express your style and decor. 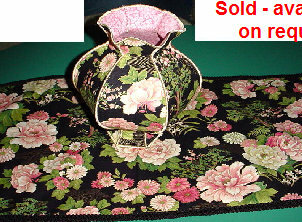 Other fabric designs, and colors available. Great for year-round gift giving. Design your own or see more variations on the next pages. Can be made with or without flowers. Prices start at only $20.00 Please contact for special orders and pricing. Please note: SOLD items are not in stock but can still be made for you.